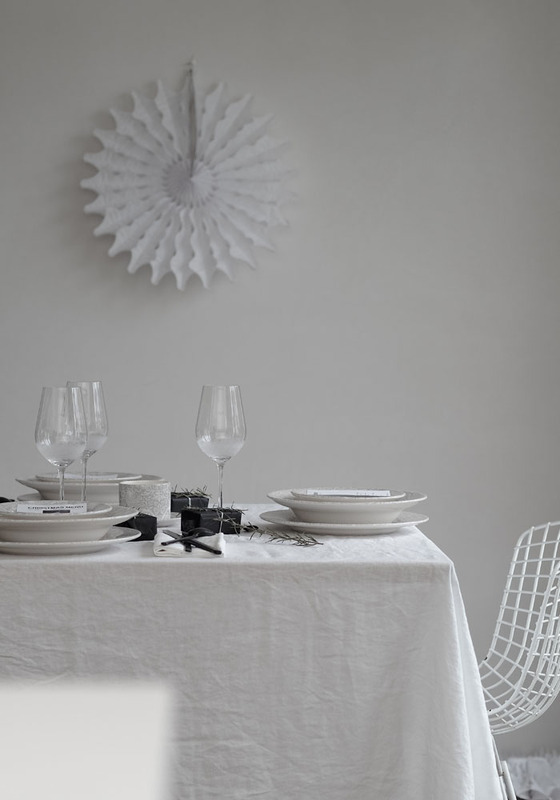 Have you planned your table settings for Christmas yet? If you haven’t, maybe you are in for some inspiration. This year, my table setting is in soft grey, white, black with a touch of green and I’ve used the beautiful Spode Pure Morris tableware which can be mixed and matched. William Morris designs are timeless. His work can be admired at the William Morris gallery in East London and earlier this year, H&M released a beautiful collection bearing his prints (there are some pieces left here). My aim was to bring together William Morris’ classic designs and a modern, table setting to create an inviting and beautiful Christmas dinner table. To create a stylish table, I first used the large 11-inch plates with the Strawberry Thief design as the base, then add the pasta bowls and these cereal bowls that I will be using for serving soup. If you already have plain white plates at home, these are perfect to complement your existing tableware. I also added these beautiful Droplet red wine glasses which I love. I’m not sure the picture does any justice to how stylish they are. They would make a great present! To soften the look, I used a stonewashed linen tablecloth and matching linen napkins from Cultiver. They have a wonderful collection of stonewashed linen in various colours, perfect to complement my Spode Pure Morris tableware. I then designed a Christmas menu in Photoshop using a mix of modern and classic typefaces. For the sake of branding, I’ve made mine my menu title: CHRISTMAS MENU with Portmeirion but I’ve designed one especially for you that says with love. You can download it to print it here and then handwrite your menu. To complement my palette of soft grey and white, I added a few black accessories like this beautiful black cutlery available from H&M Home. I also wrap a few plain matching boxes in black gift paper (the same I used for this year’s Advent Calendar) and tied some Rosemary on each box. My beautiful black Japanese apron is from Cultiver. To keep things simple, I cut plants from our garden and use a mix of Olive tree branches, Rosemary and Lavender. They all look beautiful together and fit perfectly in my stoneware vases from H&M. I think mine are now sold out but this one would work too. I had lots of fun styling this Christmas table and I hope you it will provide you with some kind of inspiration if you were thinking along those lines. This article is posted in partnership with Portmeirion and contains affiliates links. Special thanks to Cultiver.